﻿Published by Sareth Ney on Jan. 13, 2017 at 5:54 a.m. Updated on Jan. 13, 2017 at 2:40 p.m.
SOMERSET, Wis. – Gary Spivack is the Northern Invasion co-executive producer at Danny Wimmer Presents. A Quarter and a Dream Pictures (aqdpi.com): How did Northern Invasion start? aqdpi.com: What were some of the most memorable performances you witnessed at Northern Invasion? GS: Korn last year stole the weekend. There are certain bands that just know how to step up to the plate in a big festival setting and know that their performance has to be special….has to be different. Korn is one of those terrific bands. Invasion's first year two years ago, In This Moment kinda woke up the festival. Other festivals we produce such as Rock On The Range are known for its wonderfully chaotic crowd surfing and mosh pits. In This Moment came with that energy early in the day and Northern Invasion had therefore officially arrived. aqdpi.com: How can an unsigned local or touring band reach/play Northern Invasion, in the future? GS: We are ALWAYS looking for hidden gems. Especially if it’s a local or regional based band. We feel it’s important to cater to the local music community. 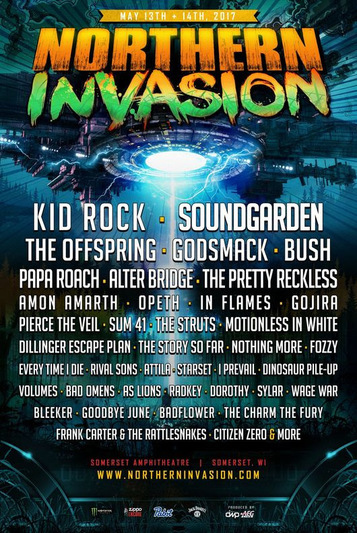 We do a promotion every year with rock radio station 93X where a grand prize winning band gets to play at Invasion. Check with 93X for sure! If your band is great…then we want to know about you. aqdpi.com: What were some of the difficult challenges you had to face, when it came to setting up Northern Invasion? GS: We look to raise the bar every year. Better talent while keeping fair and competitive ticket prices and a better overall fan experience. We feel we've done this for Invasion 2017. From Soundgarden to Godsmack. From Amon Amarth to The Struts. From Gojira to The Pretty Reckless. There really is something for EVERY rock fan to enjoy at Invasion this year. aqdpi.com: Which artists would you like to take part of the Northern Invasion bill which has yet to take part already? GS: Let us get through Invasion 2017 and I’ll get back to you. LOL. Again, we always look to raise our own bar each and every year and plan to do so for 2018, 2019 and beyond. Trust us on that one! We never rest!! aqdpi.com: I’m a festival director and producer too, which set of knowledge would you share? GS: Be passionate. Listen to the audience. Be honest and try not to take ‘No’ for an answer. Give your fans the best bands for the best ticket prices in the best location possible. And with Northern Invasion, we feel we are doing just that. Tickets are available and they can be purchased at www.northerninvasion.com. Options include layaway packages, hotel, camping and very important person (VIP). Four tiers for camping are also offered for purchase. Levels for hotel packages include bronze, silver, gold and platinum are also options. All camping and hotel bundles come with a $25 festival merchandise voucher, for each person. Sponsors consist of: Jack Daniel’s, Monster Energy, Pabst Blue Ribbon Brewing Company, Zippo and more.